Another busy show today with six ‘girls around town’ in the studio, talking about everything from feet and festivals to bras and biscuits!! Deborah Garlick, Nadine Cooper and Liz Hobbs joined June, Tina and Sue between 11am and 1pm – no time for photos this time, we were far too busy chatting. 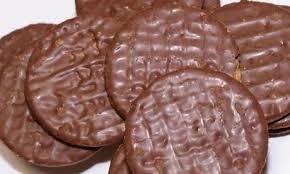 It seems we’ve all been eating our choccy bikkies the wrong way round – shock, horror! – and, purely in the interests of research of course, we had a packet on hand to hand to check it out. Unfortunately, the Henpicked pair conveniently forgot to bring along the special bras they’ll be donning next Saturday for the London MoonWalk, raising money for breast cancer sufferers. But we’ll be keeping an eye on their respective Facebook pages so watch this space for a pic or two next week; in the meantime, if you want to support their efforts by making a donation, click here for more details and a link to the Just Giving pages. With Newark Festival returning to Riverside Park next month, Liz had plenty to talk about too. Live concerts on Friday 20 and Saturday 21 June feature Union J, Rough Copy, Luke Friend, Loveable Rogue, Tich, Ollie Marland, Heaven 17, Marc Almond and The Human League; and on Sunday 22 June, there’s a fantastic FREE family fun day which culminates with Proms in the Park and a fabulous fireworks finale. Check out the Festival website for times and ticket details. And, if you haven’t already done so, don’t forget to enter this week’s competition to win a pair of tickets for the Friday concert – you’ll find a reminder of the question here.